This week’s WWW is a great Rhone style blend from Ventana Vineyards . It’s their 2008 Le Mistral. Having recently had some of this at a great blending seminar Koala was rummaging around in the wine fridge and randomly selected a bottle and by chance it was a lucky pull. This is a very easy drinking wine that is quite at home as a standalone drinker or to pair with food. The 2008 Le Mistral is dark and savory with black fruit, dried herbs and hint of white pepper. With a deep red color and intense character, it is spicy with complex layers of dark currant, licorice, red berry and has a long lingering finish. The 2008 blend is; 62% Syrah, 28% Grenache, 5% Alicante Bouschet, 5% Petitie Sirah. This is a good wine with a good price point and we give it a 7+ and *** . With a great 20% discount for club members we could not resist. Happy with his drinking selection Koala consumed this delightful wine over two nights and was just as happy the second night. Sometimes that is not the case! A recommended drop from Monterey County California! This event, the Le Mistral BlendingSeminar was held at the Intercontinental Hotel on Cannery Row in Monterey California. A wonderful area surrounded by the majesty of the Monterey Bay. The hotel is in a beautiful spot and is easy to get checked into. Just pull up and they will take care of everything. The room featured a fireplace, balcony, an ocean view as well as a view of Cannery Row and was very well appointed and comfortable. While I was not using my brain and forgot the reception started at four so was busy showing his friends around the Cannery Row area on what was a spectacularly beautiful summer day. The good news is they were on time for the Le Mistral Blending seminar. As we were welcomed in and selected our seats, it was immediately apparent that this was to be a full on, hands on, play with the wine and blend up a storm kind of event. There were pipettes, funnels, beakers and numerous bottles of different varietals of wine on every table. We were talked through the philosophy of the Le Mistral wine by the wine maker Sabrine. The goal was to make a blend along the line of the Le Mistral only better (at least in your mouth). Much easier said than done, even though you are given the same components. Le Mistral is a blend which includes the major grape varieties, or cépages, that have been grown in the Southern Rhône Valley of France for centuries. These include (but are not limited to) Grenache, Syrah, Mourvèdre, Cinsault and Carignan. We also had the use of Petit Syrah and Alicante Bouschet. There are remarkable similarities between Monterey, California’s wine growing regions and the Southern Rhône Valley, including the blustery afternoon winds for which this Rhône-style wine is named. Ventana people being a friendly knowledgeable group who went out of their way to make it a pleasure for everyone. We even got to meet Allan (a guest at the event) a wonderful gentleman who had met the Queen on more than one occasion! So we all got to make a bottle of our blends and put a label on it and push the cork in and spin the foil on. Everyone got to take home their own unique bottle of Le Mistral. So we know you are thinking “wow that was a great night”. Well that was part 2, remember the brain lock missed the drinks and appetizers part 1. Serious fail! Now it was on to part 3 the evening's wine dinner that was prepared by Executive Chef of The Clement Monterey Jerry Regester. Each course was specially prepared to be paired with one of the Ventana wines and the Le Mistral collection. The dinner was served with panoramic bay views on an outdoor patio on the second floor as the sun set. The five course meal and pairings were amazing! This was also a good time to reflect on some things you had learned and to chat with those at your table. Monterey Bay put on beautiful weather, The Clement is a great facility and the people at Ventana know how to put on a great event and to make each and every person feel like a VIP. So to Randy, Bruce, Loren, Barbara, Elizabeth, Georgette and Sabrine, thank you for a wonderful evening! None of us rose early enough for breakfast but stopped into the Clement restaurant and had lunch before heading out. An order of yummy Calamari and a juicy Kobe beef burger was excellent. The staff of the Clement took care of our luggage while we all dined. The attention to small details helped make a nice place a great place. Thanks! 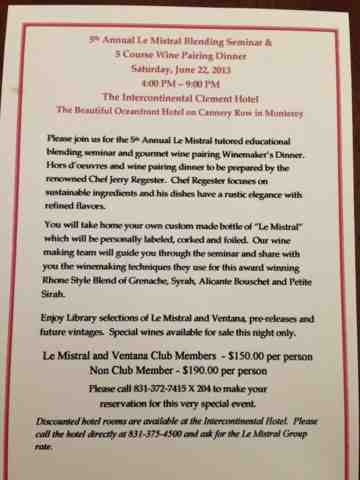 The Le Mistral Blending Seminar is a must do event in the Monterey area and we totally 'recommend' it. We are looking forward to future events and maybe we will let the Kiwi join us next time! The 2014 Event is on, don't miss out!!!! Its Winter and the sun is shining and the birds are singing and, well, today (Saturday) is the day we visit Paso Robles and check out a few large style tasting rooms and give them the once over. 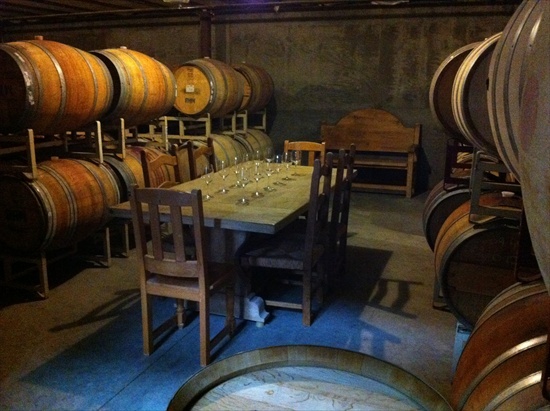 So we know, you want to know, why we picked the wineries we did. It was a very scientific and deeply thought out approach. Koala spit out names and Kiwi said no, yes, no, yes, yes, and we will see how it goes. 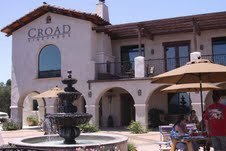 We decided to start at Vina Robles because it was on the right side of the road and the first one we came to as we headed out on Hwy 46 East. The facility is quite large and a bit intimidating and although there is plenty of parking it’s a bit of a walk into the tasting room. But take your time and enjoy the short stroll and appreciate the view as it is very nice. As you enter the facility it is large and spacious gift shop and specialty wine related food area. Moving thru to the tasting area it is also very open with very high ceilings and lots of room although the tasting bar is not large and is a bit dwarfed in the large space. We were greeted warmly by Anna and told of our tasting options, a standard $5 and a Reserve $10 with an optional Artisan Cheese pairing for an additional $5. We chose the Reserve, passed on the cheese, and got to it. 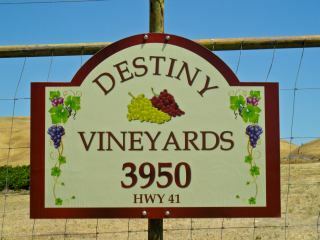 There were six offerings starting with the 2008 Creston Valley Petit Sirah. We did not particularly care for this one mostly because as the tasting note said “lingering chalky tannins on the finish” so for us a 5 with ***. Next was the 2008 Signature, 83% Petit Verdot, 15% Petit Sirah, 2% Cabernet Sauvignon. A step up for the better with a medium bodied wine that had good balance and nice finish. A 6 for us with ***. There was also a young lady wandering around with slices of 1/4" thick cut Harris Ranch Beef with some horseradish sauce on bruschetta style bread. Yum! Nice surprise and very very good. The 2008 Suendero with 68% Cabernet Sauvignon, 32% Petit Verdot was again a step up. A elegant wine with bright fruit and soft long finish. This was a 7 with ***. Anna our tasting assistant was quite knowledgeable about the various estate vineyards and regions the grapes were sourced from and had some interesting facts about the winery and is operations. So next up was the 2007 Syrée with 79% Syrah, 21% Petite Sirah. This was a nice full bodied wine with ripe dark fruit a full mouth feel and an earthy under tone with a smooth finish. We both felt this was a solid 7 with ***. The 2007 Syrah Ryan Road is 100% Syrah and we both thought it was to be our favorite. A good example of a Paso Robles full bodied ripe dark fruit Syrah with good tannin structure and a long finish. We both agreed it was a solid 7 with ***. The final taste was the 2007 FORE Petite Sirah 100% Petite Sirah. Wonderful intense ripe dark fruit with some peppery spice nicely balanced to have a great mouth feel with nice acidity with a lovely finish that hangs on just long enough. Kiwi 7, Koala 8 with ***. This was Koalas favorite and so a bottle was purchased and Kiwi violated the wife rule of one bottle per winery and purchased one also but then added a bottle of 2007 Syrah Ryan Road. Our overall impression of Vina Robles is; a must stop in if you’re in the area to try for yourself. Don't forget to tell them Kiwi and Koala sent you! This winery makes some very good boutique style wines that are well priced and very enjoyable. The tasting experience is complemented by the staff who were friendly and knowledgeable enough for all but a ponce (probably had someone there that could handle those one of those as well) The only thing we taught them was what the derivation of the word FORE in golf was. So go by and check em out we 'recommend' you do. With Kiwi out of town this couple of weeks this Week’s Winner of wine we drink when no one is looking is really just Koala’s Weekly Winner. The taker is an inexpensive drop from Sextant Wines in San Luis Obispo County. It’s their 2010 Sextant Wheelhouse Zinfandel. You may be thinking this would be big and brash but it’s actually a nive easy drinking medium to full bodied Zinfandel that carries itself with grace. Deep color with lots of dark fruit and a hint of smokiness this wine also has nice balanced tannins to go with a long big finish. A good versatile drop with a nice full mouth feel that would go well with steaks and BBQ. A 7 on the official scale and **** at only $21.00. This week’s winner won out over a couple of others because of its balance of great taste at a great price. There are a few great tastes’s to be had at Sextant and here is where you get them. Go on, have a taste at Sextant and tell em Koala set you! That darned Kiwi called at the ungodly hour of 10am on Saturday morning. Like an excited puppy dog with a great idea that could not wait, he wanted to drive to Paso Robles and see what Koala was talking about after the Pebble Beach Food and Wine Grand Tasting when he mentioned Hunt Cellars as a must taste. Plus his missus was away...So who in their right mind could turn that idea down? So off we went like a bucket of prawns in the sun to Hunt Cellars. 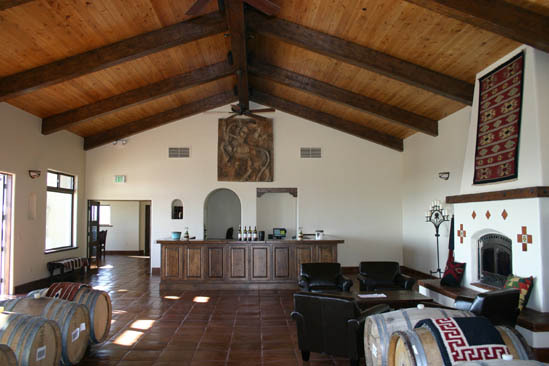 As you drive along the scenic Highway 46 West, about three miles west of the 101 Fwy arriving at Oakdale Road, you will find Hunt Cellars. 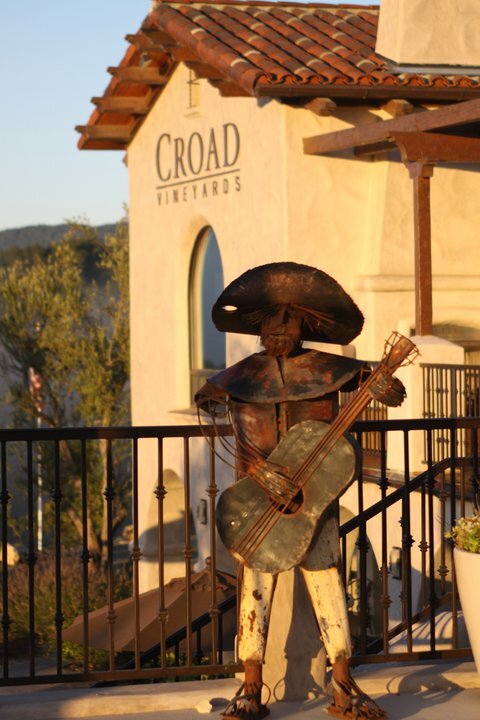 In 1997 they began producing their first releases of memorable wines from the 550 acres of Creston road. This unique property met their criteria in topography and soil composition. Within the 550 acres there were four terrior’s identified with varying elevations containing soil composites that mirror the great wine regions of the world. Experience has taught David Hunt that in order to make great wines you must simply have the best fruit. Arriving at the tasting room we were greeted warmly. As we strolled up to the Cabernet Bar, the friendly staff set us up with glasses and the tasting list and eagerly led us through a light hearted and fun sampling of wines. The wine list is full of great selections that will make anyone happy and some are exceptional. The wines can be purchased online but we recommend a visit to the tasting room. We’re pretty sure that David will not whinge about selling to you online but it’s a beautiful spot. The wine we purchased was the 2005 Thriller. We know we copied each other which we do try not to do, but we were not paying attention and it just happened by chance. The 2005 Thriller has wonderful soft layered red and dark fruit and subtle earthiness, with nice balance and an long easy finish that begs for another sip. This is a unique blend of Syrah, Cabernet, Petite Sirah, Merlot, Zinfandel, and Cab Franc, of which David will not disclose the magic mix information. A solid 7+ and ***. Overall a great group of wines for tasting, worthy of a return visit, and hopefully a wander in the vineyards, with some time spent with the man behind the magic. A worthwhile stop if you find yourself in the Paso Robles area. Tell’em in the tasting room the blokes from WineWalkabout sent you!